Dr. Samantha Hansen was awarded a Presidential Early Career Award by the White House, the highest honor bestowed by the United States government on science and engineering professionals in the early stages of their careers. From the 2014 Celebrating Excellence | Dr. Samantha Hansen spent Thanksgiving 2013 – and several weeks on either side of it – shoveling snow in Antarctica, and she’s likely to spend the next two Thanksgivings doing the same. But shoveling snow in more than 30-degrees-below freezing temperatures is the beginning of her labors. She now has more than 200 gigabytes of data that she will painstakingly anaylze over the next year to try to map a massive subsurface mountain range that is almost completely covered in ice and snow. 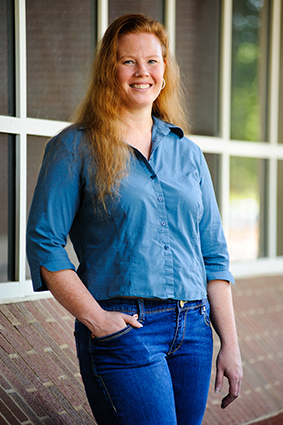 Hansen, an assistant professor in the Department of Geological Sciences, is receiving funding for the project from a five-year $715,000 CAREER grant she received in 2012 from the National Science Foundation. The grant funds the installment and upkeep of 15 seismic stations along portions of the Transantarctic Mountains in Antarctica, stations which collect data as higher-magnitude earthquakes occur across the planet and distribute energy throughout the earth’s interior. Hansen is using the data created from that energy to map a portion of the range that was previously unexplored. She installed the stations in November 2012. When she returned home after collecting her first round of data in November 2013, she received an unexpected email from the White House. The email, an early Christmas present that arrived in her inbox two days before December 25, informed her that she had been selected by President Obama as a Presidential Early Career Award winner. The honor places her among the top 102 researchers in the country in the early stages of their independent research careers. 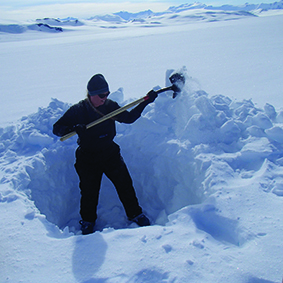 Dr. Samantha Hansen digs a hole to install one of 15 seismic stations along the Transantarctic Mountains in Antarctica. Antarctica is a “cool” place to work in more ways than one, according to Hansen, who has now traveled there four times. The other unique thing about working in Antarctica, and specifically being stationed at the U.S. research center in McMurdo, is that everything revolves around science. The work doesn’t come without its challenges, however. The route itself requires a trip across the International Date Line and more than 20 hours in four separate aircrafts – commercial flights from Birmingham to Dallas to Sydney to New Zealand, and then a four to eight hour flight in a military-style cargo plane with an open-air cockpit and jump seats. And then, of course, there’s the weather. When Hansen’s team goes to Antarctica to gather data, the team often has to dig the stations out of the snow. Most of the sites average temperatures of -30 degrees Fahrenheit. The coldest site hit -80 this year. The other challenge lies with the data. “Seismic data takes a long time to process, so it’s going to be some time before we have any results, but we had over a 90 percent recovery rate from the stations, which is phenomenal,” she said. Once the work is done, Hansen said she hopes to use the data to learn more about how the 3,000-mile-long mountain range formed.